You are currently browsing the tag archive for the ‘Virgin Jackson’ tag. Marianne de Pierres is one of Australia’s most prominent science fiction authors. Under a pen name, she has also published acclaimed crime novels, and her most recent book (as de Pierres) is a YA dystopian novel that is receiving rave reviews. She has had games and songs inspired by her books and worked with other creators to build interactive content. She has created a unique online brand with multiple websites, with an online persona as active and interesting as the author in real life. So it’s no surprise that de Pierres is pushing her boundaries once again, seeking to expand her readership in new ways with Peacemaker, a web comic based on de Pierres’ own Virgin Jackson world (so far only seen in short story form). 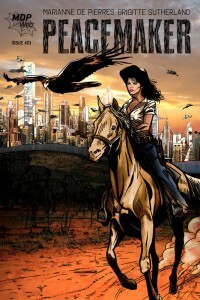 The first issue of Peacemaker introduces us to Virgin Jackson, a ranger in a futuristic national park enclosed in an Australian super city, the US Marshall Nate Sixkiller, come to investigate her or the park (we aren’t really sure), and the beginnings of a strange, supernatural storyline. While the story itself is perhaps a little hard to assess in such a very short first issue (although having read in Virgin’s world before, I guarantee quality plot and characters as the comic progresses! ), I could unequivocally recommend this issue on the strength of the artwork alone – Sutherland has produced high quality pictures that tell as much as the dialogue, bringing Virgin to life. In this new venture, de Pierres has created something special, with a heroine that is already shaping up to be not just tough, but interesting on many levels. I look forward to following Virgin’s adventures in future issues.